Reverse with "TWENTY DOLLARS" (not legal tender). Broad-struck over original US Mint Saint-Gaudens gold double eagles of 1907-1928. Augustus Saint-Gaudens' original sketch for his iconic Double Eagle design featured a Winged Liberty figure holding a shield. Using as much of the original sculpture as possible from an actual coin, the relief was increased and wings and shield were added by Daniel Carr. This concept shows what the original version might have looked like if carried to fruition. 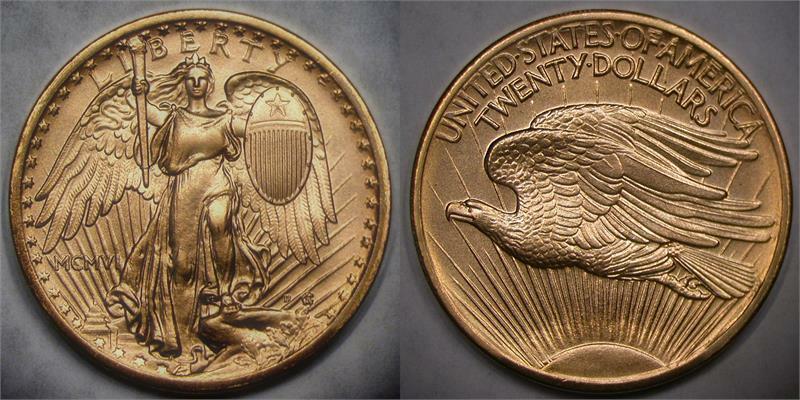 The cost for this product is $400 plus the US Saint-Gaudens 1907-1928 $20 gold Double Eagle to over-strike. Purchasers of this product will receive back the exact same coin(s) sent, after over-striking. Significant detail outlines from the original coin may show after over-striking. Best results are acheived when over-striking coins that do not have major damage, rim dings, or edge cuts. Cleaning/polishing is ok. Coins of questionable authenticity will not be accepted for over-striking. Size: About 35.0mm (slightly larger than original). Edge: Original raised letter edge shows, but is significantly flattened.